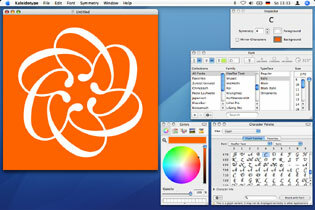 Kaleidotype is an application that lets you create symmetric patterns (‘kaleidotypes’) from any character of any font. What makes it so special is the interactive nature of the process – the user can manipulate the pattern immediately, which has a fascinating effect. The name ‘Kaleidotype’ is a mix of ‘kaleidoscope’ and ‘type (face)’. The program really works like a kaleidoscope with characters and produces similarly diverse patterns. It was created out of passion for typefaces and symmetric phenomena. When I came across the font Hypnopaedia by Emigre, I wanted to create patterns like those myself. However, this is very difficult to do by hand, since you have to move all copies of the original character at the same time and in a perfectly symmetrical fashion. This makes the search for beautiful patterns very hard. A perfect task for a program! The first prototype was created using REALbasic. It was used for two gift wrapping papers (click on pictures for larger view of detail images). Through my employer at that time, Gute Botschafter GmbH, a cooperation with Verlag Hermann Schmidt Mainz started, who published Kaleidotype in 2005 as an extended product including a transformable cube and a memory board game. The final application was written using Apple’s excellent developer tools and libraries, Xcode and Cocoa. 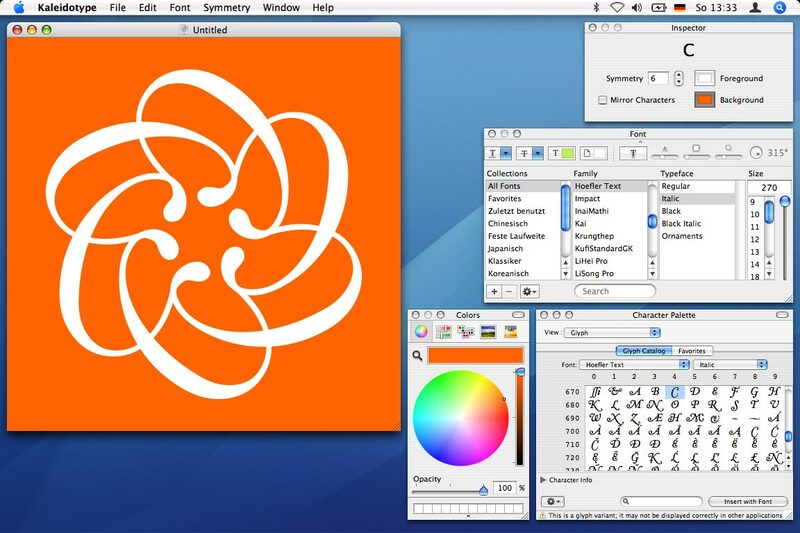 The Mac OS X platform was especially suitable for Kaleidotype, for instance because of its use of the PDF format for screen display and the support for Unicode. Through the system-wide character palette (see screenshot above; click to show original size view), characters from Chinese, Japanese, Hebrew, Arabic and many more scripts can be entered into Kaleidotype. Note: While you may still be able to buy version 1 somewhere, I am working on a complete rewrite to bring Kaleidotype into the modern world of Apple devices. Stay tuned!